GP Engineering (North West) Ltd are experienced process pipework contractors and install industrial prefabricated and on site fabricated pipework across the UK. With over 40 years experience carrying out industrial process pipework installations in carbon steel metal pipe / stainless steel pipe and upvc pipe. 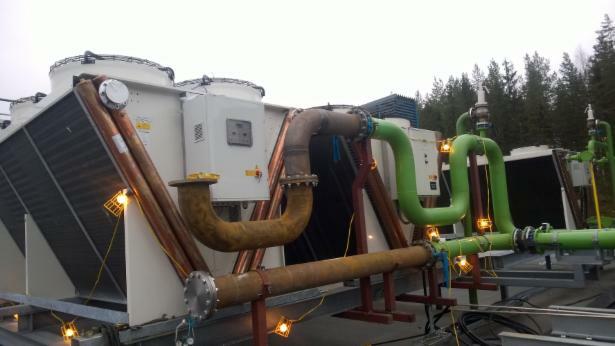 In December 2014 we traveled back to Mäntsälä Finland to install an additional roof mounted chiller and the associated 8" process pipework working in sub zero temperatures our fitters completed the install. Complete industrial process pipework layout design and installation services. Pipe fabrication for new heat recovery systems & cooling systems designed to bringing savings in gas and electricity to our customers . We have a work force with over 40 years of experience in pipe fabrication and offer repair and maintenance to existing process pipework installations. Pipe welding is carried out in our work shop prefabricating as much carbon metal pipe or stainless steel pipe as possible before delivery to site cutting down on installation times. Pipe fabrication carried out on site is kept to a minimum allowing the customer to continue with their day to day business undisrupted for as long as possible. Carbon metal pipe is sometimes required to have many forms of protection whether it be the material itself or additional treatment after fabrication Surface protection inlcuding powder coating / cemprotec E942 & galvanising.